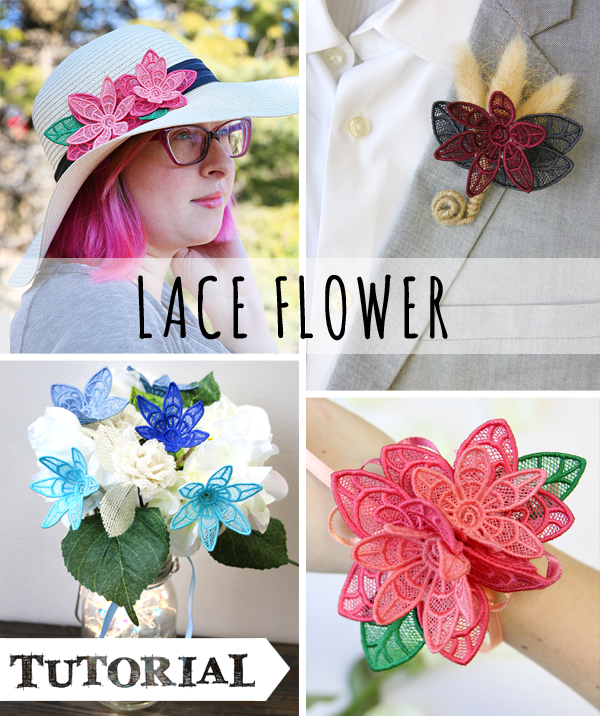 Let creativity bloom with these quick and beautiful projects -- inspired by a single freestanding lace Wildflower design. Mix and match elements, repeat and overlap to create timeless floral pieces. From embellishing summer hats, to creating your own boutonnieres, wreaths, corsages, and bouquets -- the possibilities are endless! First things first: you'll need to download the Wildflower (Lace) design for your embroidery machine. 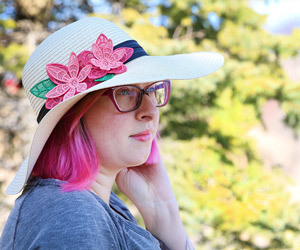 This tutorial will walk you through how to put together an embellished hat, a floral fascinator, a corsage, a boutonniere, and a bouquet using a variety of materials. 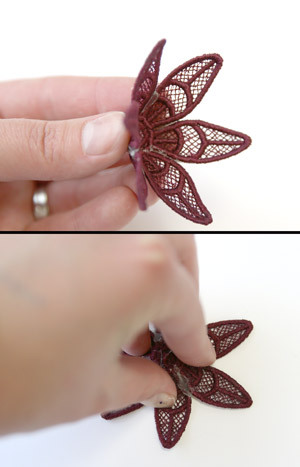 Here's more on stitching freestanding lace, if you need a refresher. At least two lace Wildflowers stitched, rinsed, and dried. I used both the larger size of the Wildflower and smaller size. 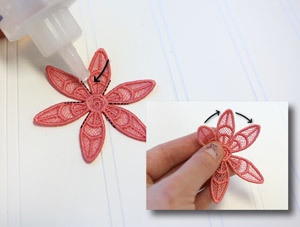 You may have noticed your larger flower piece (the "A" file) already has some dimension and curve to it from the stitches hugging in together at the connected petals. You can achieve a similar dimensional curve to the smaller flower piece (the "B" file) by adhering each petal piece to the next with glue. 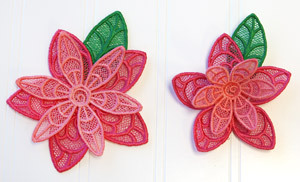 This is what the difference is, between leaving the flower petals flat and gluing them together. The flower on the right has more dimension and "stands up" a little more than the flat flower on the left. Either way you prefer to do it, they are still gorgeous pieces! 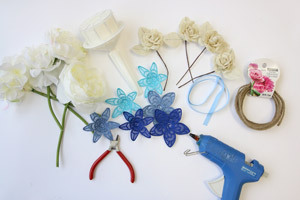 Start by gluing your flower pieces together. This is a slower process if you are using Fabri-Tac, as you will need to let each section dry independently before moving onto the next -- but it's well worth the wait! 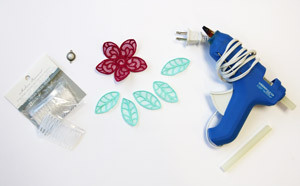 Next, flip over your flower and attach the leaf piece(s) to your flower, testing placement before setting your glue. 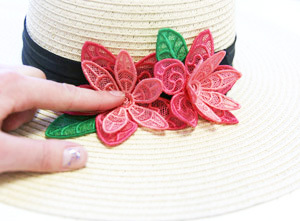 Finish by slightly overlapping your floral pieces onto the sash of your hat, or even directly on the hat itself. Use a couple as accents, or line the whole brim -- it's up to you! 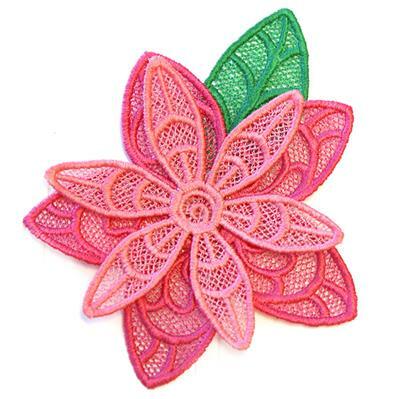 Our next project is a beautiful floral fascinator! 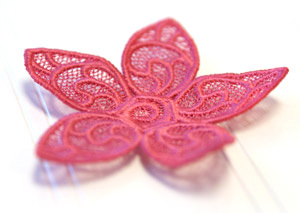 Perfect for casual and dressy occasions, this dynamic lace beauty is simple to make and oh-so-elegant to wear. At least one lace Wildflower stitched, rinsed, and dried. I used the larger size of the Wildflower, just the "A" file and several "C" files stitched out. 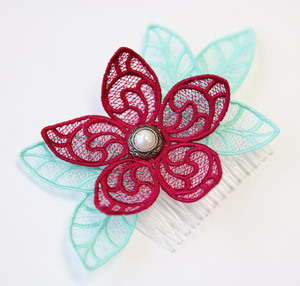 Plastic hair comb, clip, or pin. Button or bead to affix to the middle of your flower (optional). I thought this pearl button would be a cute addition to my fascinator, so I started by gluing it down in the center of my flower. 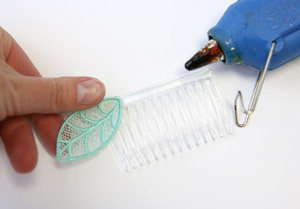 The next step is to glue the leaf pieces onto your comb, by dabbing a small amount of glue at the end of the leaf. Arrange your leaves in a random order and glue them down, but make sure not to cover the comb too much. 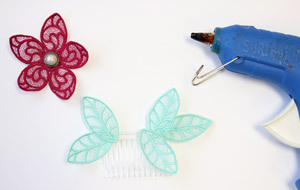 Your final step will to be to adhere the center of your flower to the comb using your hot glue. And there you have it! 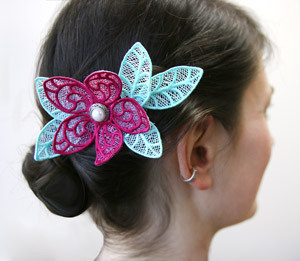 A fabulous and unique hair accessory, perfect for any occasion. 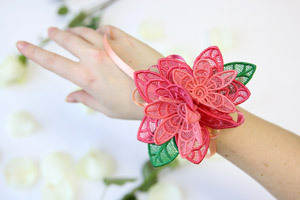 Need a corsage for a wedding or special event? 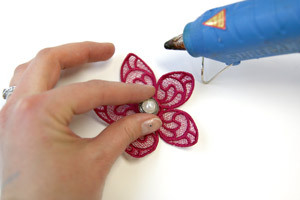 Make your own beautiful creation using your mad embroidery skills! A beaded corsage bracelet (found at your local craft store). To begin, I double-knotted the attached ribbon and added my own for purely decorative purposes. 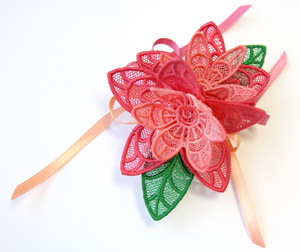 The corsage bracelet I purchased had a small platform, which I tied my ribbon around, then looped into a bow. Strategize your placement before committing to glue. My flowers were already glued together before I glued them down to my bracelet platform. Adding in extra leaves is a great way to make your corsage feel lush and full! 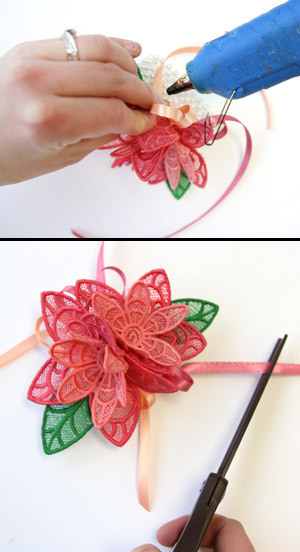 After your lace flowers and leaves are attached to your platform, you can add additional loops to your ribbon by gluing them in place. The final step is to trim your remaining ribbon, angled so it doesn't fray. 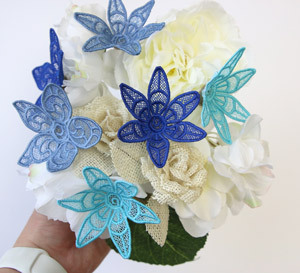 The result is a beautiful handmade lace corsage! Perfect for weddings, proms, and other special events. 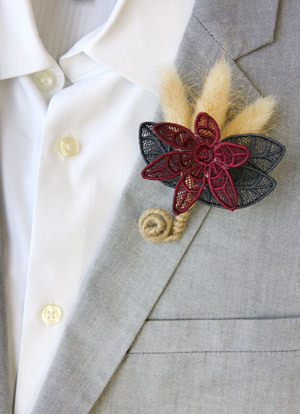 What better to go with a lace corsage, than a lace boutonniere? 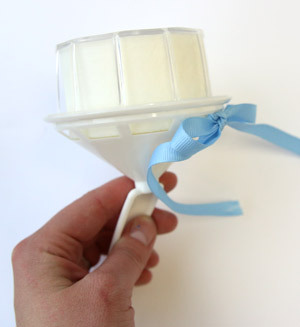 This handsome accessory can come in handy at weddings, formal events, and more! At least one lace Wildflower stitched, rinsed, and dried. I used the smaller size of the Wildflower, just the "B" file and several "C" files stitched out. 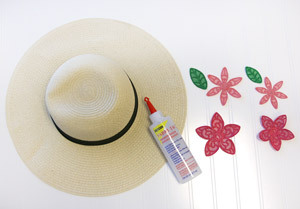 Start by gluing each of the petal pieces of your "B" file together. 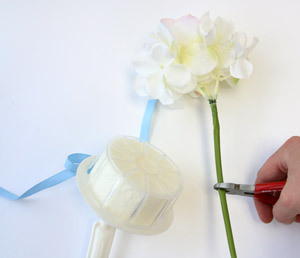 Once dry, give your petals some extra dimension by pulling back the unattached pieces. The best way to do this is to press them down on a hard surface, while still maintaining the dome shape of the center of your flower. 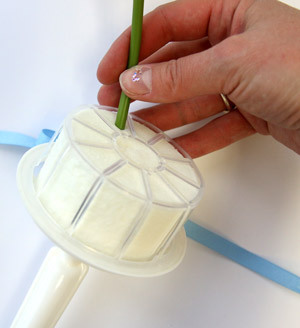 It may help to group a bunch of your flowers together, then use a small dome-shaped object (in this case a 1/2 teaspoon) placed at the center. Flip over the flowers, with teaspoon underneath, and place a heavy open object on top of your petal edges. I found a thread cone does the trick! The longer you leave this, the better the shape, so I left my sit overnight. 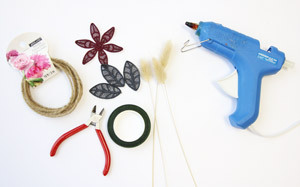 Next, use your burlap covered wire to make a tight spiral, and glue the center of your flower down. If you have other elements you would like to add, now's the time! I gathered three bunny tails, and grouped them together using floral tape. Since your flower is already attached to your base (the wire), pull them together and start looping around the stems of your elements. 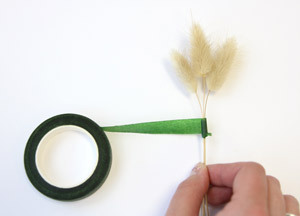 Trim the stem about an inch down, then finish wrapping before cutting the wire. 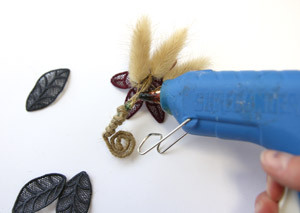 Leave about 3-4 inches extra if you would like to wrap the wire into a curl at the end. 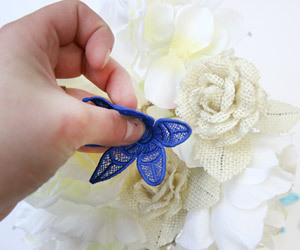 Finally, add your lace leaves, using hot glue, to the back of your boutonniere. 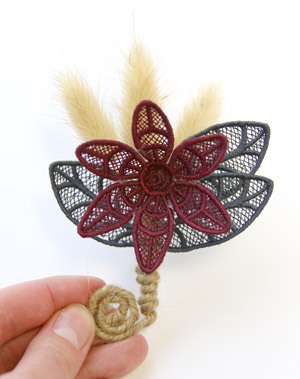 Your finished boutonniere is ready to impress! Choose different thread colors and tailor this formal accessory to your theme and color. From beautiful accessories, to the main attraction, use your freestanding lace wildflowers to create a stunning and everlasting bouquet! Several lace Wildflowers stitched, rinsed, and dried. I used both the larger size of the Wildflower and smaller size. Ribbon (I used 0.5 x 18 inch ribbon). Begin with your bouquet base. I started by tying my ribbon through and making a bow. 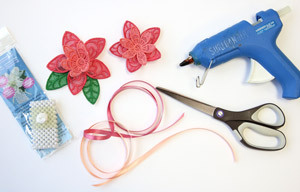 Start placing your silk or paper flowers, cutting them to length with your wire cutters. The length you choose depends on how large you want your bouquet to be and how lush it will be (how many elements you are adding may require a longer length to fit everything in). The base I chose came with a Styrofoam platform, so I was able to simply push each flower into the base easily. 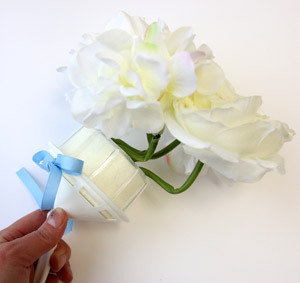 Wire stems make it easy of you to adjust the height of the flowers as you go! 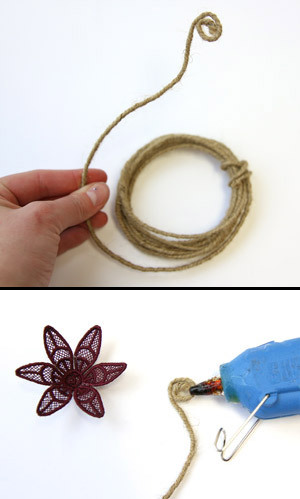 Next, using the same technique as our boutonniere, grab your burlap wrapped wire, curl it into a tight curl, then hot glue the middle of your flowers down. The more you make, the more lush your finished piece will be! 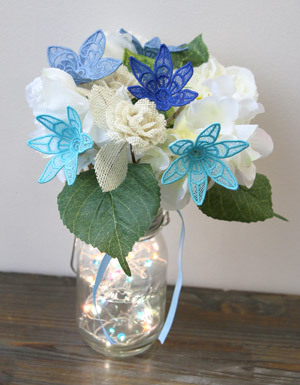 Finally, set your lace flowers into your bouquet, spreading them equally around the base. Your finished bouquet is ready to rock! Try using different combinations of colors to achieve a collection unique to you!